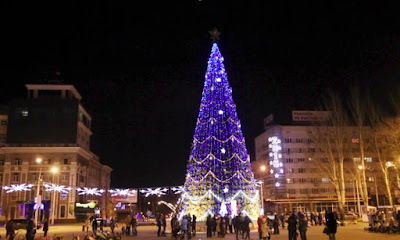 DONETSK, Ukraine -- The holiday market in the central square of Donetsk, the principal city of rebel-held eastern Ukraine, has all the trappings of a celebratory time — shiny ornaments, colorful toys and a cartoon-faced kiddie train on a meandering track. In this image taken from video taken on Sunday, Dec. 27, 2015, shows the central square is illuminated to mark the upcoming New Year and Orthodox Christmas celebrations in Donetsk, eastern Ukraine. The holiday market in the central square of Donetsk, the principal city of rebel-held eastern Ukraine, has all the trappings of a celebratory time -- shiny ornaments, colorful toys and a cartoon-faced kiddie train on a meandering track. While full-scale fighting in the war between Ukrainian forces and Russia-backed separatists died down in 2015, true peace appears a distant prospect. Shooting and shelling erupts sporadically despite repeated cease-fires called under an internationally mediated peace agreement. The latest truce was declared last week by the Contact Group negotiators from Ukraine, Russia and the Organization for Security and Cooperation in Europe, but the antagonists each have claimed violations by the other side since then. It's an emotional whipsaw for Donetsk's residents. "A feeling of peace? Sometimes there is. But when they start to shoot, you don't feel any kind of peace," said Alexandra Kirichenko, an 18-year-old student, walking down a street where apartment windows shattered by fighting were blocked off with plywood sheets. In the central square, a middle-aged woman named Galina was trying to sell toys for parents to give their children on New Year's Eve, the main day for presents in much of the former Soviet Union. Her mood was as grim as the toys were merry, her words as terse and direct as a telegram from the front lines. "Uncertainty; you live from day to day; constant tension, fear," said Galina, who declined to give her last name. Even if the fear abates for a few hours or days, the region's economic difficulties make life a constant grind. The Ukrainian government has halted payment of pensions and social stipends to the rebel-held areas and cut off business contacts. The isolation brings both high prices for scarce goods and high unemployment. "It's harder and harder to sell anything," said Galina, whose stock of toys was compiled before the war, which has killed more than 9,100 people, started in April 2014. If the fighting is less intense than it was a year ago, the issues behind it remain just as passionate and resistant to resolution as ever. The fighting began after separatists in the primarily Russian-speaking Donetsk and Luhansk regions seized government buildings, saying they wanted no part of the new government formed after Russia-friendly President Viktor Yanukovych fled in the face of mass protests in the capital Kiev. The separatists alleged the new government was so Ukrainian nationalist that it was effectively fascist and would run roughshod over the east. The Minsk peace agreement signed in February — a second try after the first agreement of five months earlier failed to get traction — calls for the Donetsk and Luhansk regions to remain part of Ukraine, but with ill-defined "special status." That lack of clarity obstructs real resolution, and the continuing fighting and economic suffering only reinforce the stalemate. "To return to what existed before — to a unified Ukraine, etc. — is already impossible. You can't wash away our citizens' memories of what Ukraine did in this period," said Denis Pushilin, the head of the rebel parliament in Donetsk. For Ukrainian President Petro Poroshenko, the situation is equally difficult. Granting amnesty to the separatists and giving them special status, as envisioned by Minsk, could be politically ruinous, angering nationalists who reject any concessions to the rebels. "The Minsk agreement exists only on paper. And so, especially on the border, it doesn't make any difference — shooting with them continues," a rebel who declined to provide his name told The Associated Press. Russia, which Kiev and the West allege is supplying troops and weapons to the rebels, has brushed off the separatists' drive to be annexed by Moscow and says it is committed to fulfilling the Minsk agreement. Russia last week announced that a close ally of President Vladimir Putin, former parliament speaker Boris Gryzlov, had been named the new Russian representative to the Contact Group. Kremlin spokesman Dmitry Peskov said the appointment of such a prominent figure indicates Russia is intensifying its commitment to the Minsk agreement "despite the fact that efforts to implement this document now unfortunately are in a pretty deplorable state." Ukrainian political analyst Vadim Karasev said Russia's interest in resolving the conflict may be more a matter of pragmatism than principle and that Ukrainian authorities see it similarly. "The alternative to the Minsk agreement is war, and that's too expensive for Kiev and for the Kremlin," he said.